Very pretty purple with contrasting polyps, the Idaho Grape Montipora is a highly sought after, and pricey coral! The Idaho Grape Montipora Montipora undata is a beautifully colored small polyp stony (SPS) coral. Although there has not been an official common name for it, it is generally known for its purple shading as "Idaho Grape". It can also be pink, pale green, or brown with pale margins. 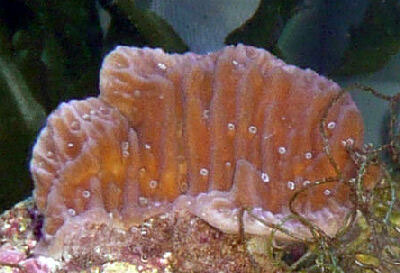 The contrasting polyps are white, pink, brown, and rust. More colors may develop as this coral is aquacultured. The M. undata is typically branching or in digitata form. Colonies have horizontal to vertical plates or tubes, and these columns and branches are generally thick. The wide variations in growth are more apparent in mature colonies. This Montipora is easy to moderate to care for, and is less likely to bleach or get the diseases that the Acropora corals tend to get. It is not demanding as far as light and water movement, but temperature is a consideration. Interestingly, the skeletons of the Idaho Grape Montipora, like other corals of this type, hold heat. Consequently they do not tolerate temperatures over 80 degrees Fahrenheit very well. The Montipora undata has been bred in captivity and has been known to double in size within a few months under the right conditions. The Idaho Grape Montipora is often confused with M. danae, consequently some may inadvertently sell an M. danae as the M. undata. You will want to identify it correctly before paying its high price. Once acquired and established, they are easy to propagate and can provide you with ample opportunities to frag. Distribution / Background Montipora Coral Information: The Idaho Grape Montipora Montipora undata was described by Bernard in 1897. It has not had an official common name, but is generally known for its purple shading as the "Idaho Grape". Where Montipora Corals Are Found: The Montipora undata are found in Australia, the Philippines, and Indonesia. Around Australia they are found in the Great Barrier Reef, Coral Sea, and the Dampier Archipelago. Montipora Coral Habitat: M. undata are found on upper reef slopes in water that is moderately turbulent, and at depths from 9 to 82 feet (3 to 25 m). Montipora, as a species, are found from deep water (greater than 10 meters / 33 feet) to the reef crest and from clear oceanic reefs to turbid (not clear because of stirred-up sediment, etc.) lagoons. Even though their range is large, Montipora are more likely to be found in quiet water at mid-depths. Description What do Montipora Corals look like: The M. undata have very porous and lightweight skeletons. This species of small polyp stony (SPS) corals are typically branching or in digitata form. The colonies have horizontal to vertical plates or tubes, and these columns and branches are generally thick. These wide variations in growth are more apparent in mature colonies. It is often confused with M. danae but its raised reticulum is not as bulbous or dome shaped as M. danae, and are thinner or narrower. The Idaho Grape Montipora can be purple, pink, pale green, or brown with pale margins and contrasting polyps that are white, pink, brown, and rust. More colors may develop as this coral is aquacultured. Difficulty of Care Montipora Coral Care: The M. undata is easy to moderate to care for, accepting a wide range of lighting and water movement. Unlike Acropora, which are in the same family, Montipora corals do not stress as easily and are more resistant to bleaching and disease. Some credit this resistance to their deep-set polyps. They are easy to propagate and are a perfect specimen for the captive reef environment. A well-feed live rock/reef environment is what is needed for your Idaho Grape Montiporal, along with some fish for organic matter production. These corals are usually hardy and fast-growing, however a mature tank is recommended. Do not place directly under metal halides due to the heat halides produce. The skeletons of the Idaho Grape Montipora, like other corals of this type, hold heat. Consequently they do not tolerate temperatures over 80 degrees Fahrenheit very well..
For tanks with metal halides, position your Monti in the mid levels. With other lighting, position your Monti at the upper to mid levels depending on the watts used. Your Monti will show whether it is happy or not by the coloring. Make sure that no other corals or even algae can come in contact with your Montipora. Monti's are mild mannered and will end up loosing any chemical warfare. Compatibility and Social Behaviors Montipora are not aggressive corals, nor do they posses strong defenses. Because of this, they must be placed away from any aggressive or defensive coral. Although not as touchy as Acroporas, the Montipora genus should still do best kept in a small polyp stony (SPS) tank. It will tolerate a mixed coral tank better than Acros, but plenty of room should be around your Montipora, even distancing it from another Montipora species. Oddly, colors can at times determine hierarchy in a tank. For instance, a brown Montipora undata will usually loose to attacks by their colored up sisters and brothers. In general, if your M. undata has any kind of tissue recession, just cut off the healthy part. Just make sure you cut into some of the healthy part also, to be sure there is no disease encroaching on the healthy tissue. Also, keep out the cyanobacteria and algae with good water movement, and your Monti will stay happy. Availability Montipora Corals for Sale: The Idaho Grape Montipora M. undata can sometimes be found at pet shops and on line. Online they can run about $149.00 USD or more depending on size. Frags are sometimes available, so getting your M. undata from a reef club may be more cost effective.